Arcade Belgium - News (en): 2017-06-29 - The King of Fighters XIV Arcade Ver. The King of Fighters XIV Arcade Ver. is the first game out via Taito's NESiCAxLive2 arcade distribution system. This game from SNK was released on Playstation 4 during August 2016 and later on Steam. It was the first time that a The King of Fighters game features 3D models (as for The King of Fighters: Maximum Impact) but on a 2D plane. The arcade version is based on the home version but 4 additional character are available: Rock Howard, Whip, Vanessa and Ryuji Yamazaki. There is a total of 54 fighters. All costumes are also directly selectable. 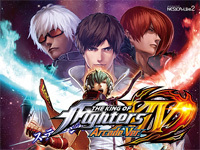 The King of Fighters XIV Arcade Ver. allows players to compete against other players of the same level from other game centers. They also can create and join guilds. When a member from the same guild starts playing, other members are informed. Furthermore, a mobile apps is available via the Apps Store and Google Play: it features players profile, battle records, rankings and guild browsing. You can watch The King of Fighters XIV Arcade Ver. opening here. 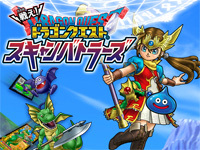 Square Enix and Marvelous announced that Dragon Quest: Monster Battle Scanner sequel will be released on July 20. As in the previous game, the player fights with his favorite monsters and uses various weapons. Cards from Dragon Quest: Monster Battle Scanner will be compatible with the new title. Fight! Dragon Quest: Monster Battle Scanner will be playable for free at the AEON MALL MAKUHARI New City (Central Grand Mall 1F Hobby Coat) from June 24 to 25. If they participate to the stamp rally, players can receive various gifts such as original tote bags and stickers! You can watch Fight! Dragon Quest: Monster Battle Scanner trailer here. 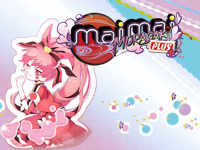 The new version of maimai MURASAKI is available in Japan today. Sega has renewed the event course category with new features. The play count system is replaced by a new stamp card system. Players can collect stamps collection thanks to the number of time they play. They can receive various bonuses depending on the play result. The new "indiscriminate class" difficulty grade has been added: songs are selected randomly from all songs. Square Enix releases Figureheads Ace in Japan Today. 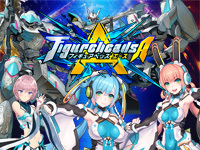 Figureheads Ace is based on the free-to-play mecha action shooter game Figureheads released in Japan in March 2016. In the arcade version, players are divided in 2 teams of 3 and compete in 3vs3 matches. They can customize their mecha named "2Foot" with parts they win during battles. They can also use "Figureheads" to add special skills to their 2Foot. Figureheads are materialized as girls. 4 girls are available: Kagura (Kagura)(voice: Honma Kaede design: Nidy-2D-), Miyabi (voice: Mari Takano, design: Nidy-2D-), Ibuki (voice: Tamura Mutsumi, design: Haleo Chiame) and Sumika (voice: Asumi Yoneyama, design: Masaharu Kikuchi). There are many ways to use the 2Foot thanks to the differents parts: universal type assault, sniper specialized, support, striker using a shield, heavy assault,... Players control their mecha with a mouse and a joystick. Collaborations with Xenogears, Front Mission and Ultraman are already announced. You can watch Figureheads Ace trailer here. 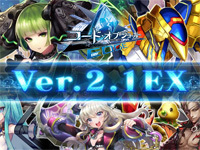 Sega starts the operation of Code of Joker EDGE Ver.2.1 EX today. This upgrade version adds 50 new cards designed by famous illustrators such as Hito, Shosuke, Niji, Hidemi Shirai and mamuru. There are also partial changes in AP (agent point) and JP (joker point) that can be acquired in the national battle: their value can increase or decrease. In addition, new joker gauge consumption "extra large" is added. 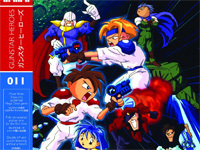 Data Discs is releasing the Gunstar Heroes soundtrack in vinyl today. This superb run-and-gun game from Treasure was released on Mega Drive in 1993 and in European arcades soon after. The music of the game is composed by Norio Hanzawa also known as "NON". He had previously composed the music of arcade games Quarth, The Simpsons and Bucky O'Hare while he was working at Konami. Gunstar Heroes is the first Treasure game on which he worked when he joined this new company in 1992. The soundtrack was recorded directly from a Mega Drive console. It includes 25 tracks across two 45rpm vinyls. You can listen to the music of the two first stages on Data Discs' SoundCloud page. Three editions exist: a limited edition in 140g vinyl where each disc is half red and half blue, a 180g colour edition with a blue disc and a red disc and an edition in black 180g vinyl. Each edition includes a double-sided poster representing the box covers of Japanese and Western Mega Drive releases. Note also the presence of two inner covers with illustrations and concept arts. Each edition costs £24.99 (plus £12 international shipping) and can be ordered at Data Discs website. Records will be shipped before the end of June. WCCF 2016-2017 Ver.2.0 is available in Japan today. This new version adds a new feature named "The Best Unit": when some conditions are satisfied and the club's best unit is appointed, a new team style is activated. New cards (Kasper Dolberg, Robert Huth, Philippe Coutinho, Ryan Giggs, Valery Karpin, Ronaldo,...) and a new card cartegory named the "STARS OF THE CLUB" are also available. 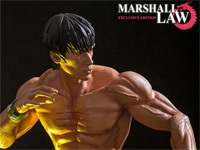 After King and Jin Kazama, it is the turn of Marshall Law to be entitled to have his own 1/4 scale statue! As a tribute to Bruce Lee (he uses the same moves, has 3 scars on the chest and wears the same clothes as the actor), Marshall Law is an American of Chinese origin who opens a martial arts school thanks to the money that he earned by winning the first King of the Iron Fist Tournament. He then opened the "Marshall China" restaurant chain but went bankrupt. Later, his son (Forest Law) had an accident with Paul Phoenix's motorcycle and Marshall needed money to pay for his son's hospital expenses and motorcycle repairs. These were his motivations for participating in the Tekken 5 Dark Resurrection tournament. It is one of the two versions of the character that is proposed where he sports a mustache and wears blue trousers with a golden dragon. The other version comes from Tekken 6 where he shaved his mustache and wears black pants with the same dragon. In the purest First 4 Figures tradition, each one of these two figures is available in two versions, a 43cm high regular edition with a base engraved with the Tekken logo and a 53cm exclusive edition with a pedestal reproducing a paved courtyard surrounded by a flying golden dragon. As usual at First 4 Figures, attention to detail is very impressive, both in the patterns of clothing and in the paint of the skin gleaming with sweat. All information about this figure can be found in the presentation video on Youtube. Pre-orders are now open with day one bonus if you order an exclusive edition within 24 hours (so until tomorrow in the afternoon). Exclusive editions (Tekken 5 DR, Tekken 6) cost $499.99 (they are available until May 30th) and standard editions (Tekken 5 DR, Tekken 6) cost $384.99 each. These statues are only available on the First 4 Figures website. They will ship in Q1 2018. The next Tekken character to have his statue will be Yoshimitsu in 4 or 5 months. A book telling the life of Tomohiro Nishikado came out a few days ago. If you don't know his name, you probably know his most famous creation: Space Invaders. But he did much more than that! 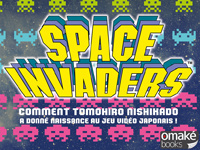 Titled "Space Invaders: How Tomohiro Nishikado gave birth to Japanese video games! ", this official biography written by Florent Gorges tells the story of Mr. Nishikado, from his birth in the Kansai town of Kishikawa in 1944 until today, when while officially retired, he's still an active consultant for Taito. Over the course of his career, he has created many other arcade games than Space Invaders, including the immersive electro-mechanical game Sky Fighter in 1970, the first scrolling video game Speed Race in 1974, the Western Gun shooting game in 1975, Lunar Rescue in 1978, Balloon Bomber in 1980 and Pop'n Pop in 1998. Besides video games, he invented many other interesting things, such as the first prepaid card system for arcades. Obviously, 60 of the 190 pages in this book are devoted to the Space Invaders phenomenon. 60 pages in which you will learn absolutely everything about this mythical game. This book is published by Omaké Books. Two editions are available; a regular edition for €25 and a limited edition of 500 copies which includes a cardboard sheath reproducing the Space Invaders upright cabinet, an animated 3D lenticular sheet and a card signed by Tomohiro Nishikado in person. This edition costs €40. Please note this book is written in French language. If you want to play Space Invaders in its original version (and many other Taito games), go to Coin-Op Legacy in Vitry-sur-Scene this Saturday at 7pm for their special Taito gathering (reservation mandatory). The third edition of HFS Summer starts tomorrow for three days of fun! Organised by HFS Play, what started as a meeting of users of the HyperSpin multi-emulator frontend with twelve arcade cabinets 3 years ago is growing! This year there will be no less than 55 arcade machines set on freeplay, including more than 40 original games with great titles like the brand new Skycurser, Pac-Man Battle Royale, DanceDanceRevolution Extreme, Point Blank, Aliens Extermination and OutRun! The event will feature many consoles and a children's area. Six tournaments are organized: the Street Fighter III 3rd Strike international HadÅ tournament with the participation of Japanese player Rikimaru, the Discmania III Windjammers French Cup organized by Windjammers France, a 2-on-2 NBA Hangtime tournament, a Garou - Mark of the Wolves tournament, a Magical Drop III tournament and a 4-player Outtrigger tournament! Visitors will also enjoy the 10-player madness of the Saturn version of Bomberman. As you see, there's plenty to enjoy so don't miss this event! HFS Summer III will take place from Friday 5th to Sunday 7th of May at the Vierzon Congress Center (in Cher county, France). The entrance fee is €15 per day or €30 for a three-day pass. Find more information on the event's website: summer.hfsplay.fr.